On Wednesday 26 October 2011 Dr John Adamson will give the Bond Memorial Lecture on ‘Sacred Space and Sacred Monarchy in Early Stuart England: the projects of Deans Matthew and Christopher Wren’. The brothers were Deans of Windsor during the reign of King Charles 1; Matthew Wren from 1627 and Christopher Wren from 1635. 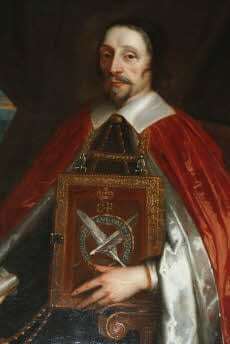 The portrait shows Dean Christopher Wren (father of the famous architect) with the Register of the Order of the Garter suspended on a chain around his neck. accompanied by a s.a.e by no later than Wednesday 12 October. Please bring photo I.D. with you on the evening. We regret there is no parking available. Entry from 6.30pm.